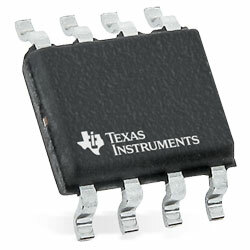 Texas Instruments LM2903-Q1 Dual Differential Comparator consists of two independent voltage comparators that are intended to operate from a single power supply over a broad range of voltages. Operation from dual supplies is possible, as long as the difference between the two supplies is 2V to 36V, and VCC is at least 1.5V more positive than the input common-mode voltage. Current drain is independent of the supply voltage. The outputs can be connected to other open-collector outputs to produce wired-AND relationships. Typical applications for automotive use include HEV/EV and power train, infotainment and cluster, body control module; and industrial uses such as power supervision, oscillator, peak detector, and logic voltage translation.